Our lives are filled to capacity with routines, habits, conversations, surprises, and disappointments. With all that’s going on in life, it’s easy to miss those quiet moments of grace which come more often than we realize. But they are there. 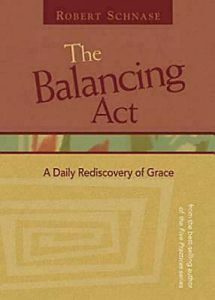 In The Balancing Act, a collection of thirty short and insightful devotional readings originally written for his blog at www.fivepractices.org, Bishop Robert Schnase invites readers to take a daily look at how to watch for and include God in their lives. The Balancing Act is written to inspire prayer, conversation, questions, and change. Feel free to use it as a personal daily devotional or in small groups. Topics include spiritual attentiveness, life goals, and prayer. Readings will be grouped under weekly themes and include group discussion questions with each of the 30 readings.